A fly fishing vacation does not have to be a camping trip. When you stay at a fly fishing lodge in Montana such as Healing Waters Lodge, you can come in from a day out on the rivers and relax in simple yet luxurious comfort. Put away your fly fishing equipment, change into comfortable clothes, and enjoy the delicious cuisine we offer. We strive to use local ingredients whenever possible, and we often use herbs, vegetables, and fruits that we grow in our own gardens. Our kitchen staff is very flexible and can accommodate virtually all food allergies, restrictions, and preferences. The menu at Healing Waters Lodge changes periodically to highlight fresh seasonal options, and also to offer returning fly fishing vacationers the chance to sample new cuisine. 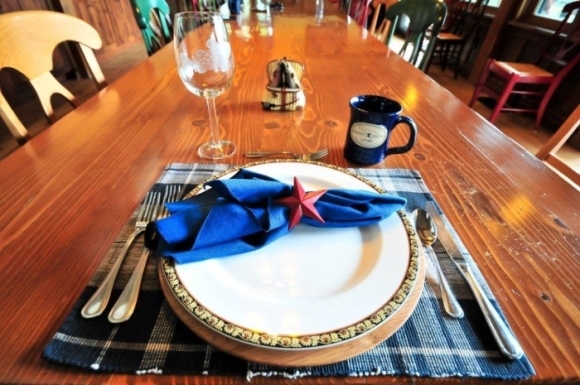 Dishes we have prepared in the past include: elk meatballs, watermelon soup, locally grown green salads with homemade dressings, seared duck breast, grilled rainbow trout, rack of venison, homemade gelato, and homemade cheesecake. The sauces, accompaniments, and side dishes will vary according to the chef’s inspiration and ingredient availability.